Different from the satellites orbiting the Earth, we have also sent spacecraft to other planets and the edges of the Solar System. Only two years after Sputnik, Soviet engineers sent Luna 1 to the Moon. The first probe that went to another planet (not just a moon) was Mariner 2 back in 1962. Mariner went to Venus. Other Mariner probes visited to Mars, Venus, and Mercury. Another series of probes named Pioneer made the trip to Saturn and Jupiter. In the 1990s, Magellan sent back great pictures of Venus. Astronomers will never stop using unmanned probes. These spacecraft are much less expensive and safer than any manned mission we could send to other planets. Expect to see more fantastic observations from probes in the future. While several missions have visited Jupiter, only one stayed to study the planet and its moons. Pioneer 11 and 12 passed by the gas giant in the 1970s. Voyagers I and II passed the planet in 1979. Even the Cassini-Huygens spacecraft made a short visit to Jupiter and used the planet's gravity to speed its trip to Saturn. The Galileo mission was the only one designed to orbit the planet and study its moons. It was launched in 1989 and once it arrived at Jupiter, released a probe to study the planet's atmosphere. Galileo was intentionally crashed into Jupiter in 2003. Scientists were worried it might hit one of the smaller moons. Like Jupiter, several missions have passed the ringed giant on their way to interstellar space. Pioneer 11 and Voyagers I and II have all passed Saturn and examined it and some of its moons. Scientists were frustrated because there was so much to study, especially the moon Titan. The Cassini-Huygens mission launched in 1997 and arrived in Saturn's orbit in 2004. It will complete a four-year mission to study Saturn's rings and atmosphere, release the Huygens probe to the surface of Titan, and image Titan and other Saturnian moons. 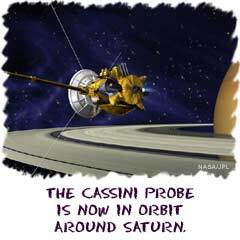 The Cassini spacecraft contains some of the most advanced onboard instruments and has been sending back amazing data. New Horizons (PKB): Launched in 2006, this New Horizons mission will reach Pluto in 2015 and then move on to study objects in the Kuiper Belt. MESSENGER: Launched in 2004, this spacecraft reached Mercury in 2011. It will orbit the planet and study its surface and evolution. It will also pass Venus and study that planet. Venus Express: Launched in 2005, this spacecraft arrived at Venus in 2006. It will map the Venus surface and study the thick atmosphere. Jupiter Polar Orbiter: Planned to launch in 2010, JPO will orbit Jupiter's poles and study the planet's atmosphere and structure. There may also be future missions designed to look at Jupiter's moons.